Dr. Elizabeth Wilcox received her medical degree from the University of Calgary, and completed her training in internal medicine and adult critical care medicine at the University of Toronto. 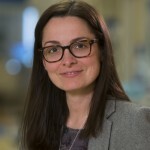 After completing research training at the at the London School of Hygiene and Tropical Medicine in the United Kingdom, she returned to join the critical care faculty at the University of Toronto and the Toronto Western Hospital. Her research is focused on the organization of critical care services and long-term outcomes from critical illness. She is currently conducting an externally funded, multisite cohort study evaluating the association of genes, EEG, actigraphy, and cognitive outcomes in survivors of critical illness (COGWELL study). 2016 New Faculty Teaching Award, Critical Care Medicine, Dept of Medicine, Faculty of Medicine, Toronto, Ontario, Canada. (Multilevel Education). Kerlin MP, Adhikari NKJ, Rose L, Wilcox ME, Bellamy CJ, Costa DK, Gershengorn H, Halpern SD, Kahn JM, Lane-Fall MB, Wallace DJ, Weiss CH, Wunsch H, Cooke CR on behalf of the ATS ad hoc committee on ICU Organization. An Official American Thoracic Society Systematic Review: The Effect of Nighttime Intensivist Staffing on Mortality and Length of Stay Among ICU Patients. Am J Respir Crit Care Med. 2017 Feb 1;195(3):383-393. Gershengorn HB, Harrison DA, Garland A, Wilcox ME, Rowan KM, Wunsch H. Association of Intensive Care Unit Patient-to-Intensivist Ratios With Hospital Mortality. JAMA Intern Med. 2017 Jan 24. doi: 10.1001/jamainternmed.2016.8457. Wilcox ME, Freiheit EA, Faris P, Hogan DB, Patten SB, Anderson T, Ghali WA, Knudtson M, Demchuk A, Maxwell CJ. Coronary artery disease, depressive symptoms and functional decline. BMC Psychiatry. 2016 Aug 4;16(277). doi: 10.1186/s12888-016-0986-3. Rittayamai N, Wilcox ME, Drouot X, Mehta S, Goffi A, Brochard L. Positive and negative effects of mechanical ventilation on sleep in the ICU. A review with clinical recommendations. Intensive Care Medicine. 2016 Apr;42(4):531-41. Wilcox ME, Harrison DA, Short A, Jonas M, Rowan KM. Comparing mortality among adult, general intensive care units in England with varying intensivist cover patterns: a retrospective cohort study. Crit Care. 2014 Aug 14;18(4):491. Wilcox ME, Chong CA, Niven DJ, Rubenfeld GD, Rowan KM, Wunsch H, Fan E. Do intensivist staffing patterns influence hospital mortality following ICU admission? A systematic review and meta-analyses. Crit Care Med. 2013 Oct;41(10):2253-74. Published-Ahead-Print: 7 August 2013. Wilcox ME, Brummel NE, Archer K, Ely EW, Jackson JC, Hopkins RO. Cognitive dysfunction in ICU patients: risk factors, predictors, and rehabilitation interventions. Crit Care Med. 2013 Sep;41(9 Suppl 1):S81-98. Review.